On an October night 100 years ago, seven 300lb bombs fell through the clouds above London. One killed seven people on landing in a street in Piccadilly. Ten more died when buildings were hit in Camberwell. 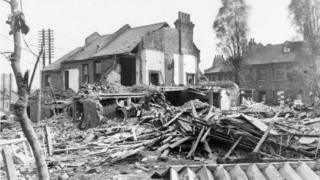 The final bomb landed in Hither Green, south-east London, killing 15 people and destroying homes. The attack was carried out by a German Zeppelin at the height of World War One, having failed in its original mission. It would go down in history as the "silent raid". Historians and eyewitnesses discuss the "silent raid"
The Zeppelin was among a group of 11 new types that had the ability to go higher than ever before - some 20,000ft. Its mission was to bomb industrial areas in the north of England. However, gale force winds and freezing temperatures meant none of the 11 would reach the destination. With its engines switched off the craft - known as L45 - was blown high over the capital. Speaking to the BBC in 1964, executive officer on board at the time of the raid, Karl Schuz, said the temperature on the L45 that night was -8 degrees Celsius. He said the crew suffered "height sickness" which caused "early fatigue, loss of conscious and the functions of the brain were no longer exact and reliable". Describing the raid, he said: "We saw some lights - afterwards darkness. We tried to get wireless bearings from Germany but we couldn't obtain them. "Now we saw a searchlight, two searchlights - I counted twenty. And that we guessed it must be London. But no shot, we were unseen, and we could see the Thames. "Now, running before the wind with a full speed, and we must drop our bombs." "A Zeppelin flying over London held the same ability to mesmerize as would a UFO appearing over the city today," aviation historian Ian Castle said. L45 was 650ft (200m) long. Compare that to the similarly-shaped "Gherkin" skyscraper standing today which is 590ft (180m) tall. "Words like terror, beauty, fascination, excitement, horror and fear appear equally in contemporary eyewitness accounts," Mr Castle added. Anti-aircraft guns could be used to bring a Zeppelin down, but on the night of 19 October the guns remained silent as the aircraft passed unnoticed above the clouds. A Commons hearing about the raid later, would hear that the L45 had been flying out of range of anti-aircraft weapons and firing on it would have given away the position of Britain's defences. The 300lb (135kg) bomb that fell on Hither Green was the final one to drop on London. A nearby police officer told an inquest he had heard a "whistling noise" before the massive explosion. One family, the Kingstons, was virtually wiped out. At the moment the bomb crashed down, Mary Kingston, a widow, was away briefly from the family home. The seven children she left behind, aged three to 18, were killed along with her nephew who had been visiting that night. Days later, the 15 victims were buried in two graves - one for Catholics and the other for Protestants. A memorial paid for by public subscription was erected. However, over time it weathered and the names partially disappeared. A new headstone has since been created and it will be officially unveiled on Saturday at Brockley & Ladywell Cemetery.